Your home's roof is a major aspect in the overall protection your home is able to deliver, as well as a big contributor to your home's exterior design. Because your home's roofing is subjected to some of the most extreme conditions, between severe weather and constant exposure to the elements, over time, your roofing can become a breeding ground for a number of different contaminants, including mildew, mold, and even algae. These contaminants can go on to create unsightly stains and streaks over the roof of your home, and in addition to damaging the looks of your home, can also pose a serious threat to its structure as they can start to decompose your roofing materials if they are left to grow unchecked. 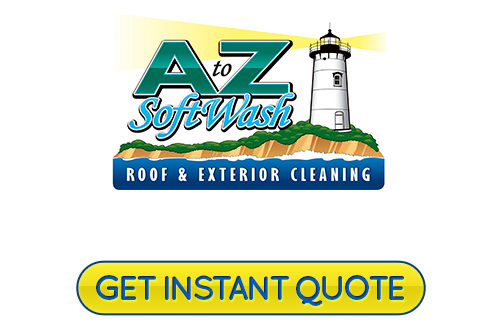 One of the best things you can do for your Rhode Island home's roof is to make sure you call in the roof cleaning professionals at A to Z Softwash. 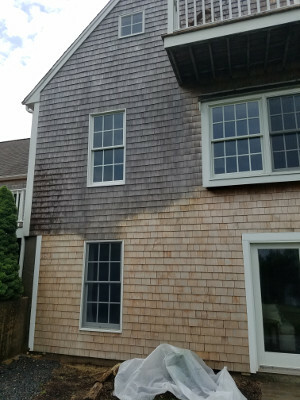 Here at our Cape Cod roof cleaning company, we are your team of local Portsmouth roof cleaning and softwash contractors who have the experience and the tool necessary to give your home's roofing and exterior surfaces the best cleaning they've ever had. All of our service professionals are prompt and efficient, and we promise that they will have your roof looking like new again in no time at all. Our team of experts will work hard to restore your home's roofing to its original condition and to fully eliminate those harmful decomposing elements to help save you from the need for future repairs. This commitment to excellent service is just part of what has made us the #1 choice among local homeowners when it comes to professional roof and exterior washing services. Give us a call today if you have any questions about our full line of professional roofing and exterior soft and pressure washing services, or if you would like to schedule your appointment for service with one of our qualified specialists. Our team of experts are always standing by and would be more than happy to take your call today. 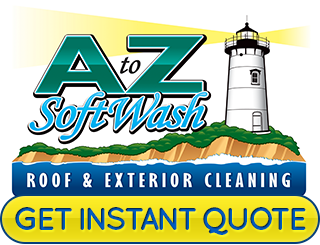 The softwashing system used by our team of specialists here at A to Z Softwash gives homeowners the perfect method to make sure that they get the quality cleaning results they want without the risk of damage that can come with using high pressure water cleaning on some surfaces of your home's exterior. Our high quality soft washing solutions combine anti-fungal, algae, and mildew compounds along with other soaps and disinfectants that are designed to break down and remove ugly stains and contaminants all without causing damage to your home's surfaces or your landscape. If your home is suffering from splotches of mildew, mold, or algae that are giving your home a worn and old look, give our team of soft washing professionals a call today and let us help you get your home looking like new again. There are a number of different reasons to make sure you have your roof professionally cleaned every so often, not least of which is to ensure that you keep it protected from damaging contaminants that build up over time. In addition to preserving the overall integrity of your home's roofing, investing in regular cleaning will also help to keep your home looking better, increase its curb appeal, and just increase your overall pride in the appearance of your home. Roof cleaning is always something that is better left to the professionals, and here at A to Z Softwash, we are ready to get the job done. If you are looking for a professional roof cleaning and soft pressure washing contractor in Portsmouth, give us a call today at 508-209-7795 or fill out our online request form.